It's Monday, July 4, 2011, and though it's Independence Day for the lucky folks in the US, it's the first day back to work for me. Maybe that's why I couldn't keep my fingers out of the frame when I took the picture. I decided to take a northern route to the office that takes me through the Montreal borough of Outremont, a very upscale neighborhood on the north slope of Mount Royal. 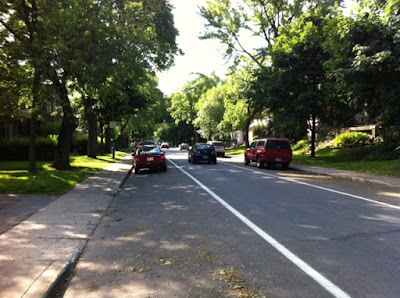 The northern portion of Outremont, that's to say the part below Cote Ste-Catherine road, sits on a gentle slope and is laid out on a fairly straightforward grid. The streets feature either detached or semi-detached brick and stone cottages on lots that are narrow but deep rectangles. Typically each home has a driveway leading to either a free-standing garage, or a garage that is part of the home, but that is accessed at the rear of the property. In some cases, particularly towards the eastern reach of the municipality, the homes are row houses with an alleyway in the rear for access to garages or sheds in the yard. 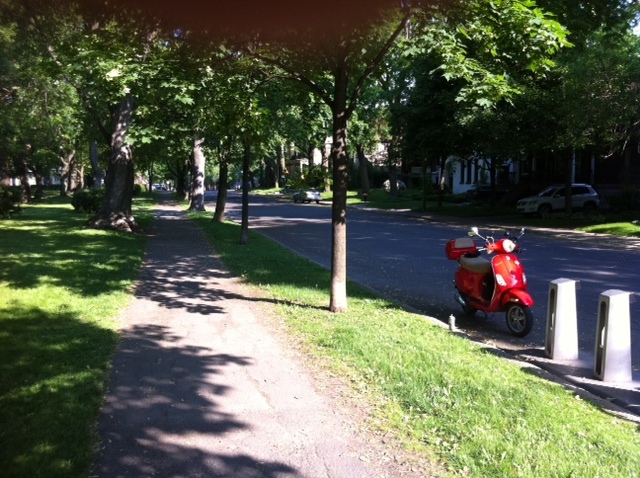 As you can see, Outremont is an oasis of green and relative calm that sits close to downtown. It's large nineteenth and early twentieth century homes make it a desirable location with home prices to match. The corner of Fairmont and Hutchison towards the northeastern edge of the town is where you'll find the Croissanterie Figaro. 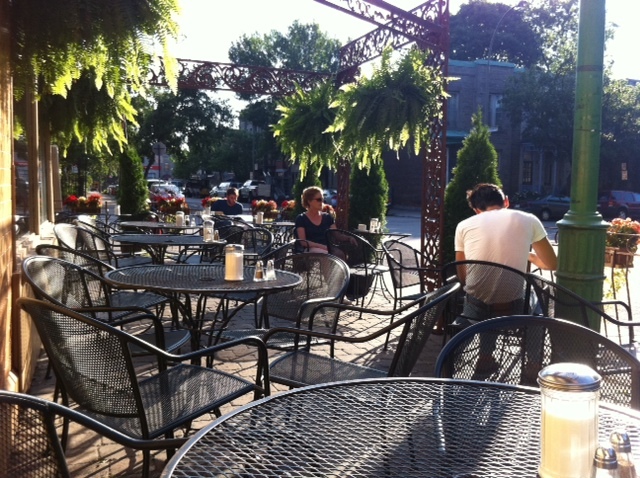 I've mentioned this delightful corner café in a post last year which you can find by clicking here. 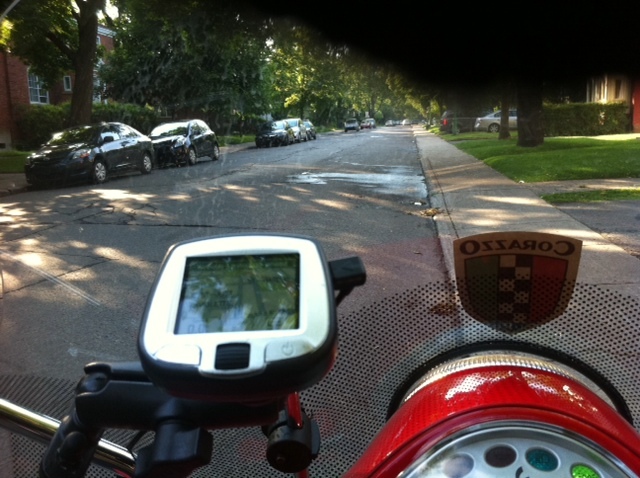 If you look very carefully you can just spot my Vespa LX150 parked at the curb. 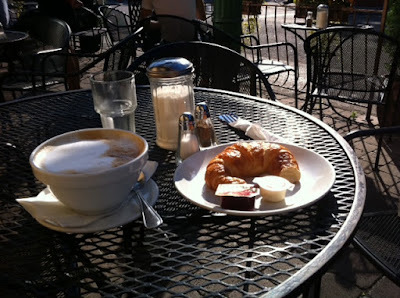 In no time a fresh croissant and bowl of café au lait is there to serve as a very gentle and genteel introduction back to my work-a-day scoot commute. As always, there's more to come. My kind of breakfast, and a great start back into work. I will have to remember this, and yes I am jealous.